In between the present Picketts and Stonebridge Locks were at least two other locks. 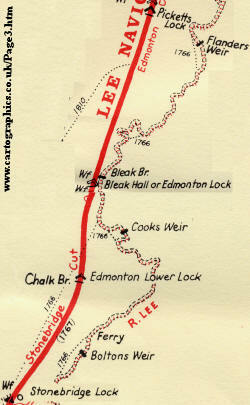 On 12.1.1780 it was “Resolved that the following Locks be repaired with all convenient speed Viz… Cooks Lock, Boltons Lock, Stonebridge Lock, Tottenham Lock, Lee Bridge Half Lock, Hackney Marsh Brick Cistern Lock And It Is Ordered that the Surveyor do repair the same as he shall find them absolutely necessary” (NA Rail 845/5). On 11.4.1783, the Surveyor was ordered to make new Gates and Slackers and repair the Brickwork of Cooks Lock (NA Rail 845/6), which became Bleak Hall Lock. 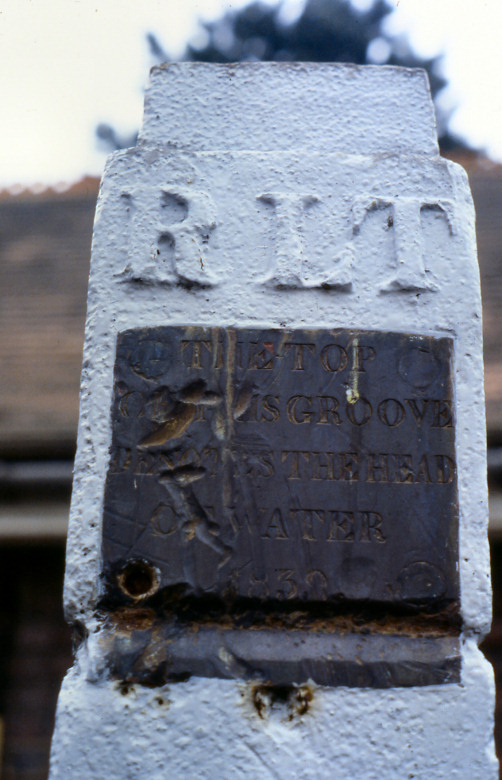 This name was first recorded in 1792 and lasted until the lock's removal in 1863, although it was also sometimes called Edmonton Lock. Bleak Hall was perpetuated in the name of the imposing Art Deco bridge built in 1927 which carried the North Circular Road (A 406) over the Navigation. The bridge was demolished in 1990 and replaced by five new bridges carrying the widened carriageways and feeder roads. From a minute of 16.7.1773, "...Joseph Brooks the Occupier of Boulton's Weir attended concerning a Satisfaction to be made to him for the Weir and the Fishery thereof for the remainder of his Leaze thereof which has seventeen years to come from Lady Day last and agreed to take the sum of twenty Pounds a year for the same which is ordered to be paid to him..."
Boltons Lock was recorded in the survey of 1792 but then went through a bewildering series if name changes – Boltons, Brook’s, Brooke’s, back to Brook’s then to Bolton’s, which it retained until 1834, when it became Lower Edmonton Lock until it was removed in 1851, although on a plan of 1844 it was also noted as Wild Marsh Lock. The locks between Ponders End and Stonebridge have replaced the weirs and turnpikes on the old River Lea now lying under the Lea Valley reservoirs. They had names like Newmans, Sotherbys, Suistons (Sewardstone), Flanders, Higham Hill, Bleakhall, Pigborns, Cook’s and Bolton’s . It is impossible to locate accurately the men who worked at these locks so they are listed all together below. p39 “…John Smith and George Taylor be removed from their situations…. The falls of these two locks were probably incorporated into Stonebridge Lock when it was rebuilt in 1860 (see NA Rail 845/15), although it seems possible that part of the fall of Bleak Hall was dredged back to Picketts Lock when it was rebuilt at the same time. 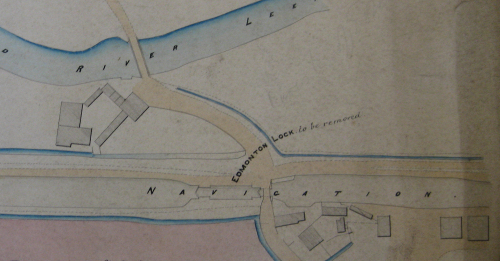 On 12.1.1780 it was “Resolved that the following Locks be repaired with all convenient speed Viz. 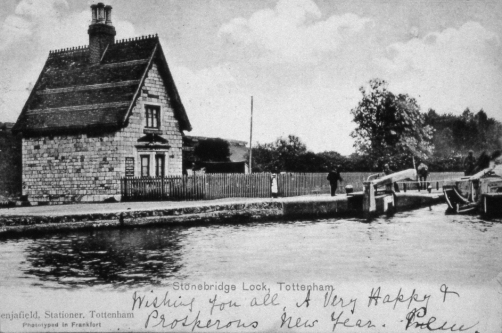 … Stonebridge Lock, Tottenham Lock, Lee Bridge Half Lock, Hackney Marsh Brick Cistern Lock And It Is Ordered that the Surveyor do repair the same as he shall find them absolutely necessary” (NA Rail 845/5). Stonebridge or Stone Bridge were interchangeable as names during the 19th century, simply depending on the clerk. 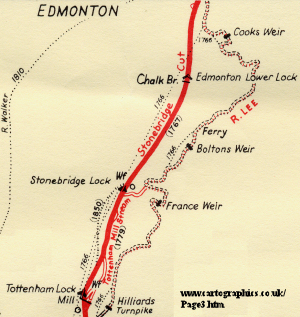 “The long wall between Edmonton Bridge and the new Stonebridge Lock has been completed….preparatory to cutting out the old half lock” (NA Rail 845/15). 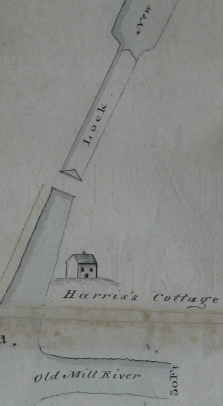 The plan to the right below shows Stonebridge Lock in 1817, with the lockman's house named Harris's Cottage". Was there a lock keeper called Harris? The old millstream to Tottenham Mill enters below the lock. 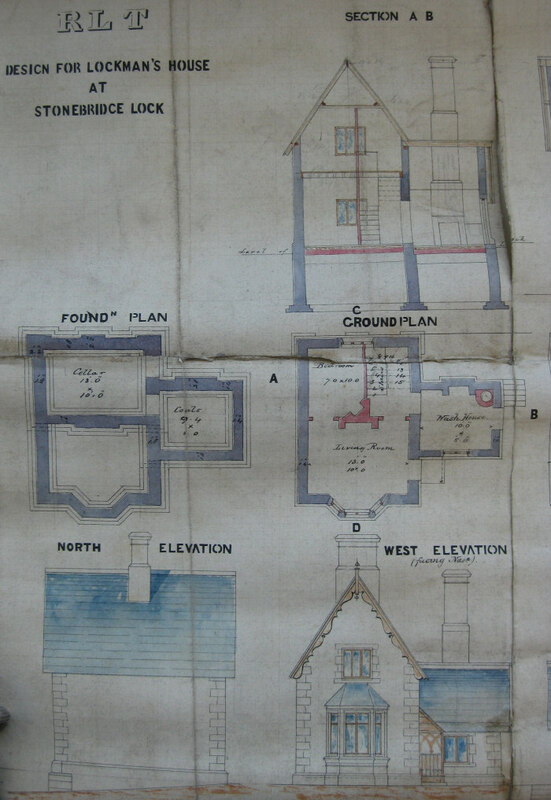 The new Lock house was authorised on 15.12.1860, although the plans are dated 1858. On 26.10.1877 “The house required some painting and papering and something to be done to keep out the damp” (NA Rail 845/21). By July 1879, it was no better - “Repairs to lock house wanted – to be cleaned and painted, cowls put on chimneys, spouting wanted and other minor repairs” (NA Rail 845/21). However, on 20.4.1883, the lock house was insured for £200 (NA Rail 845/23), although it was not among the houses noted as “new”. 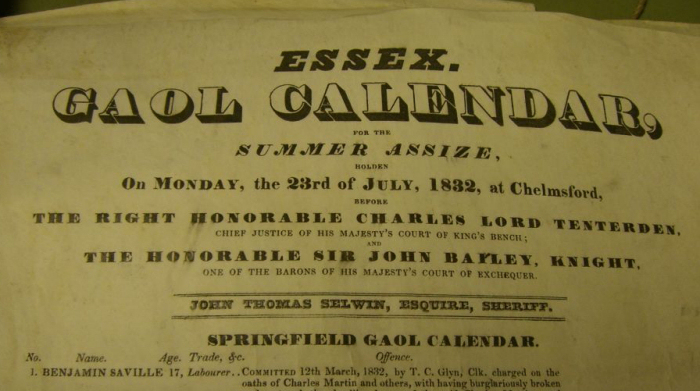 In 1877 it was also resolved that “bathing be permitted at the spot in question after seven o’clock in the evening until ten o’clock in the morning, the (bathing) shed or screen to be erected to the satisfaction of the Engineer; all persons bathing there to wear Bathing Drawers, and the Tottenham Board to see that this Regulation is observed” (NA Rail 645/21). Lock keeper Page received “permission to move his wooden shed from side of Lock house to offside near the Bathing Shed and to pay a Rent of 10/- instead of 5/- as now” NA Rail 845/21). 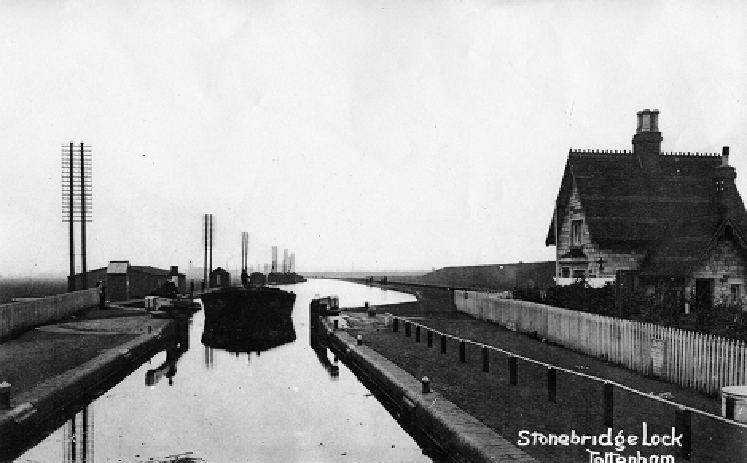 Stonebridge Lock was duplicated in 1961, when the Conservancy house was demolished to make way for the new chamber. The remains of the original 1776 wooden lock complete with an official River Lee Trust miller's post (below) were discovered under the house. A new house was built on the western side of the Navigation. Appointed ex Waltham Town as a disciplinary measure.